We want all kids to love reading. In this episode, Stephanie does a deep dive on how she works with students who find reading challenging. She teaches us about how reading is comprised of two main components (fluency and comprehension). She gives a million ideas on how to support struggling early readers and students who struggle with reading in middle school and high school. Steph also provides a ton of resources and ideas that are centered around cultivating a love of stories. Parents may feel anxious because their child is behind their peers in reading. For those parents, we want you to remember that it is your child’s own race. It also might be comforting to know that we often get calls from parents who are worried about the same thing. You are not alone. 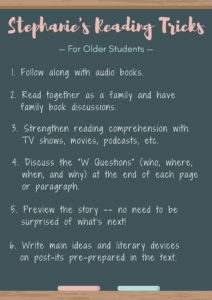 It does not matter if there are other students in your child’s class who are reading at higher levels. In the end, every kid will get there, at their own pace. 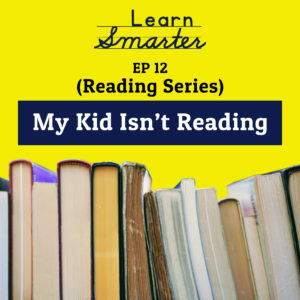 There is one major concept we want parents to think about when it comes to their child struggling with reading and that is that most of the time it is not just about reading. We are not saying this to worry any parents. We are saying this so that parents can be aware. Usually, if a student is struggling with reading they are struggling with something else in particular. If you can remediate it now, there is less of a chance of it showing up down the road. Reading generates anxiety in students, especially when it comes to reading out loud in the classroom. A lot of teachers use a method called popcorn reading. Oral popcorn reading is when students are either expected to jump in and read a paragraph or sentence or are chosen by the teacher to read. Because students are nervous for their turn to read they tend to skip ahead and mentally rehearse their part while other students are reading. This causes them to miss out on listening (and therefore comprehending) which in turn puts them in a bad spot when their teacher gives a pop quiz or asks a question about the content. Similar anxiety can emerge at home for students who don’t love reading. Reading is primarily made up of two different components. One component is decoding (which is sounding out the words) and the other is comprehension (which is understanding what is being read). Both areas need to work together seamlessly in order for a student to be a successful reader. This brings us to the topic of fluency versus comprehension. When a child is a fluent reader they are able to easily decode and read words flawlessly. Often times, when working with a child who is struggling with reading the focus is on comprehension. Reading strips: To make your own reading strip, you can take a piece of paper and cut out the middle so that the child can only read one sentence or even one word at a time. You can also buy reading strips on Amazon. Have your child follow along with their finger: This will help them to focus on one word at a time. Choose books that are at your child’s reading level, not their grade level: There is an application you can download and use called Book Fairs by Scholastic which will tell you the reading level of a chosen book. When reading to your child, make sure it is age appropriate and at their grade level–this supports vocabulary and helps maintain interest in books. 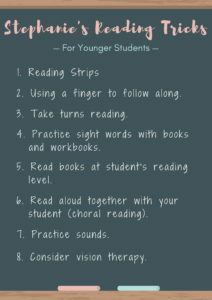 Choral reading: read simultaneously with your child. Slow down everything you read as your child speeds up to match you.